STORAGE READY. Power out of the Box. Smart Turbo-Technology for extra power. 10 YEARS SYSTEM GUARANTEE 2 YEARS FREE. PowerSet. Download "STORAGE READY. Power out of the Box. Smart Turbo-Technology for extra power. 10 YEARS SYSTEM GUARANTEE 2 YEARS FREE. PowerSet. 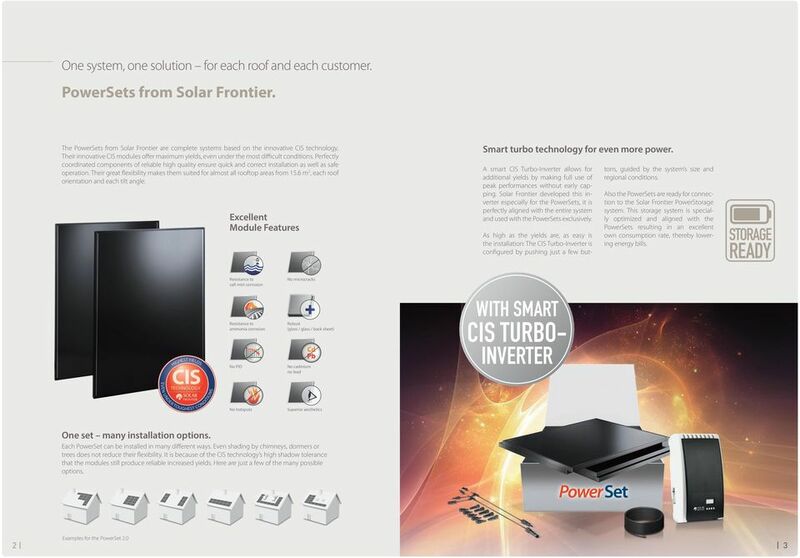 www.solar-frontier." 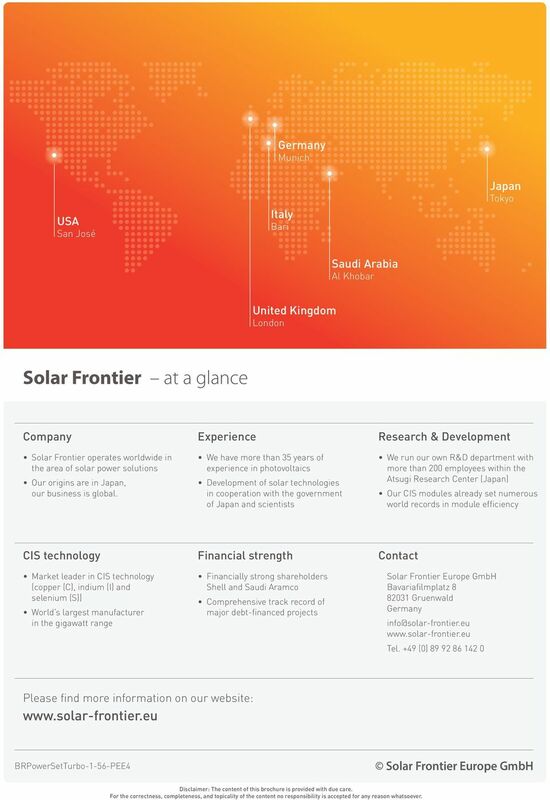 5 Germany Munich USA San José Italy Bari Japan Tokyo Saudi Arabia Al Khobar United Kingdom London Solar Frontier at a glance Company Experience Research & Development Solar Frontier operates worldwide in the area of solar power solutions Our origins are in Japan, our business is global. We have more than 35 years of experience in photovoltaics Development of solar technologies in cooperation with the government of Japan and scientists We run our own R&D department with more than 200 employees within the Atsugi Research Center (Japan) Our CIS modules already set numerous world records in module efficiency CIS technology Financial strength Contact Market leader in CIS technology (copper (C), indium (I) and selenium (S)) World s largest manufacturer in the gigawatt range Financially strong shareholders Shell and Saudi Aramco Comprehensive track record of major debt-financed projects Solar Frontier Europe GmbH Bavariafilmplatz Gruenwald Germany Tel. 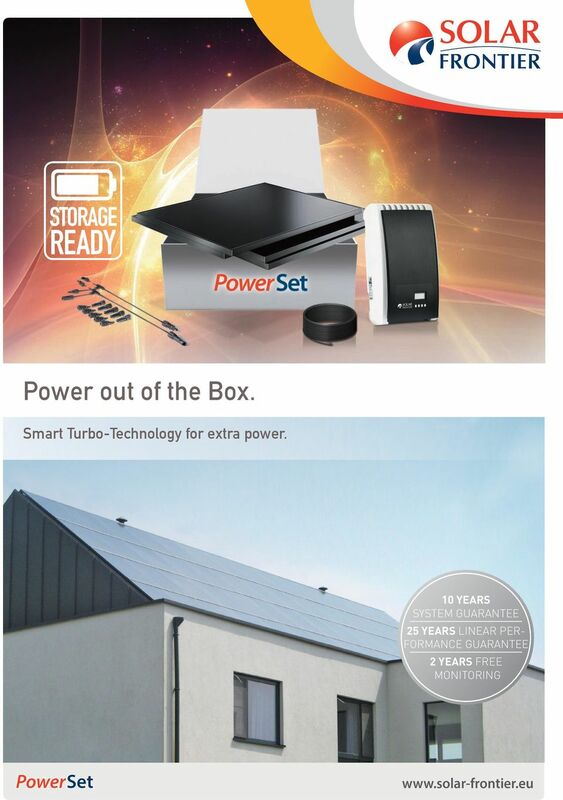 +49 (0) Please find more information on our website: BRPowerSetTurbo-1-56-PEE4 Solar Frontier Europe GmbH Disclaimer: The content of this brochure is provided with due care. For the correctness, completeness, and topicality of the content no responsibility is accepted for any reason whatsoever. 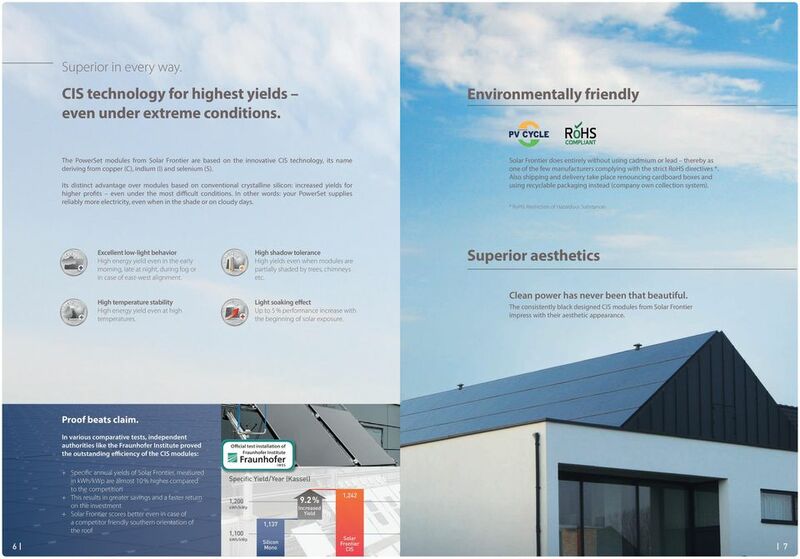 Photovoltaic on buildings Wedel, Germany September 2014 solarnova At a glance Our product solarnova is a German based technology company with more than 30 years of experience on the photovoltaic sector. Pilkington Activ. The forecast will always be clear and cool. Pilkington Activ Range Self-cleaning and solar control glass for conservatories. Rev. 2016_0529_EN 2000kVA ONE SUN, ONE WORLD, ONE UNIT BELECTRIC is one of the most successful enterprises in the realization of free-field solar power plants and utility-grade energy storage systems. Your yield in safe hands. Operation & Maintenance with IBC SOLAR. 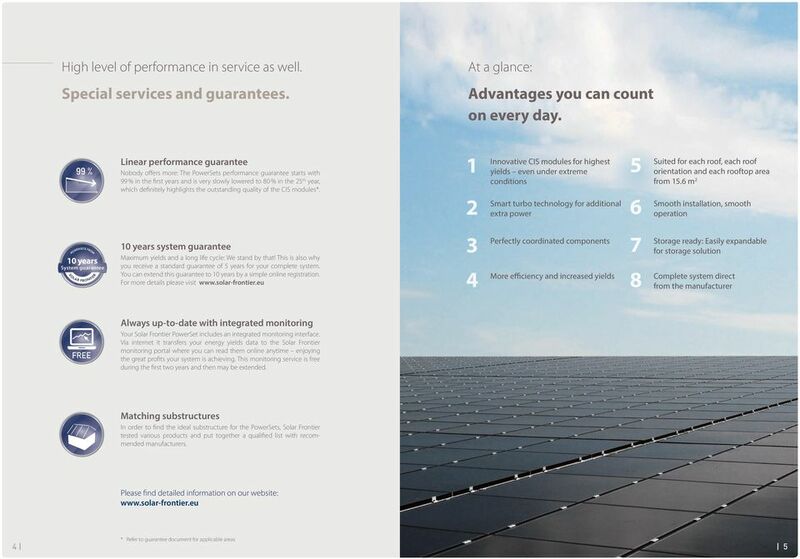 3M Products for Solar Energy. Designed for efficiency. Built to last. Self-Cleaning. The forecast will always be clear and cool. Pilkington Activ Range Self-cleaning and solar control glass for conservatories.